Effective and good client communications are an important part of being a Cat Friendly Clinic. Who are the staff in the clinic? 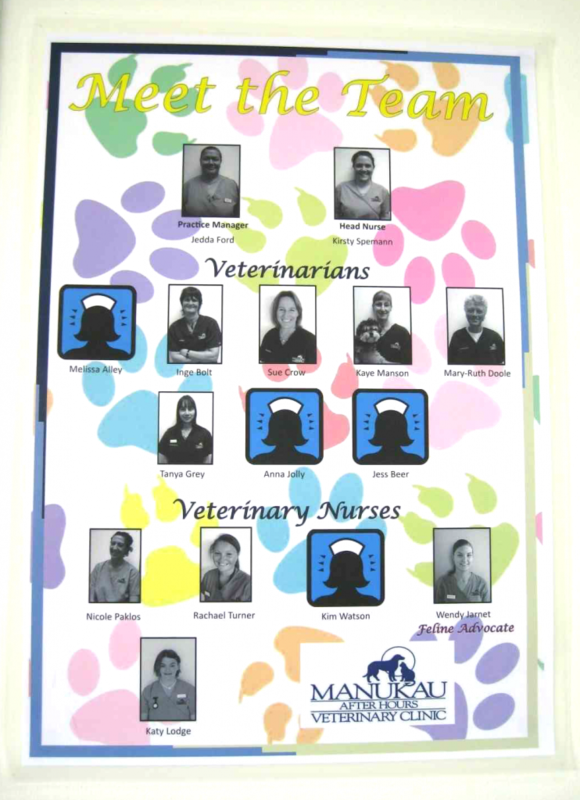 Having a display board in the waiting room with pictures of the staff, who they are and what they do is the easiest way for clients to access this information. Some clinics do not like to have information displayed on the walls in the waiting room – if that is the case we suggest having a book readily available in the waiting room with this information, so it can be easily accessed and used by clients. It is a good idea to also have this information on a clinic website, but this alone is not sufficient for clients – think about it from their perspective – being able to identify who staff members are and what their role is from a board or book in the waiting room is a reassuring and friendly approach. As part of the Cat Friendly Clinic programme, the clinic must nominate one or more ‘Cat Advocates’ – individuals in the clinic who will take on the responsibility of ensuring Cat Friendly Clinic standards are being maintained and all the accreditation criteria are met or exceeded. Their role must be clearly displayed (on a board in the waiting room or in a book accessible to clients in the waiting room as above), and clients should know they can approach them for further information or advice if desired. It is also good practice for a clinic to be pro-actively engaged in communicating with its clients. This could be in the form of regular emails, clinic newsletters, a Facebook page and/or other social media activity etc. Information may include relevant updates about the clinic and its staff, information about diseases and preventive healthcare information. How can clients get emergency treatment? Not all clinics are able to offer a full 24 hour emergency service. If a 24 hour emergency service is not available at the clinic, it is important that clients know how to obtain emergency veterinary treatment for their cat when the clinic is closed. For example an answer-phone message can be provided, on the clinics regular phone number, telling clients how they can obtain emergency care. A sign could also be placed on the clinic door giving similar instructions. It is important that investigation and treatment options are discussed with clients and that realistic estimates of likely costs involved are provided. If investigations and/or treatments look likely to exceed estimated costs owners should always be informed, together with further discussion of options. It is good practice (and essential when requested) for estimates to be provided in writing and also for itemised invoices to be provided. Owners should be providing informed consent for investigations and treatments undertaken – that is, the procedure or treatment should be explained to the client along with any risks involved. Owners should always be allowed to ask questions, and only if and when the client agrees should the procedure or treatment go ahead. Informed consent should involve the use of signed consent forms, at least when the cat is being admitted to the clinic for procedures. Ideally, as part of an ongoing improvement programme, clinics should encourage feedback from clients so that they are aware (from a client’s perspective) of things that are done well, and things within the clinic that need improving. Where specific complaints are made by clients, these should be dealt with in a courteous and professional manner. Ideally all complaints should be recorded, along with the outcome of the complaint.